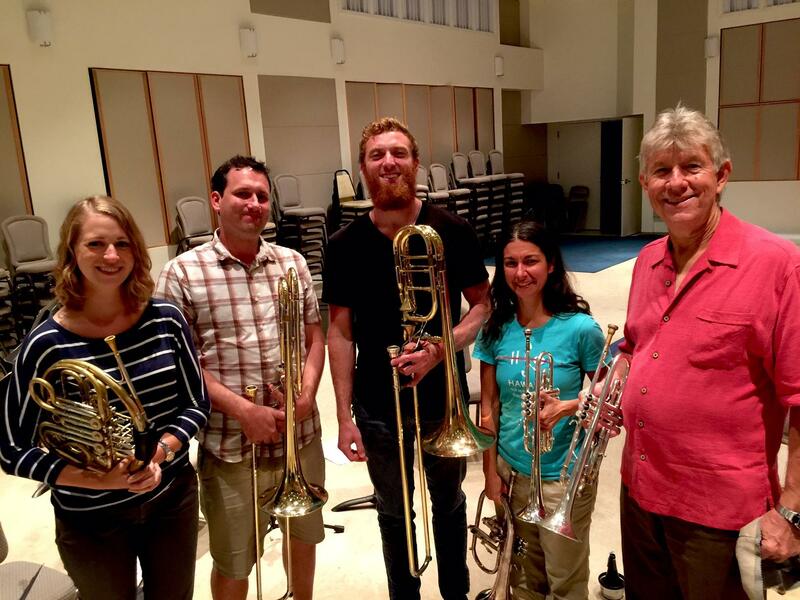 The Honolulu Brass Quintet: (l-r) Julia Filson, French horn, Jason Byerlotzer, trombone, Rudi Hoehn, bass trombone, JoAnne Lamolino and Ken Hafner, trumpets. We take a look at what the Honolulu Brass have in store for their 40th Anniversary concert and hear a bit of the new commissioned work. The group is comprised of Ken Hafner and JoAnne Lamolino, trumpets, Julia Filson, French horn, Jason Byerlotzer, trombone and Rudi Hoehn, bass trombone. They are all Hawaii Symphony Orchestra members. 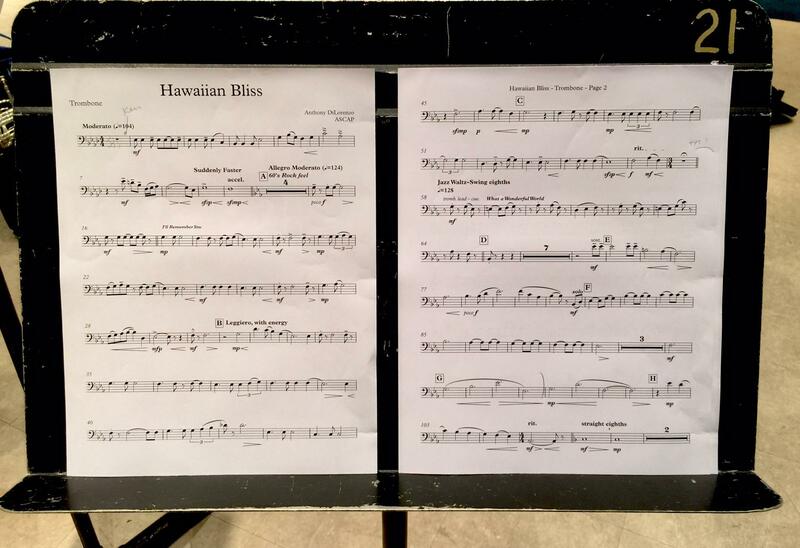 Composer, trumpet player, Anthony DiLorenzo was commissioned to create an arrangement of Hawaiian music for the Anniversary concert. "I'll Remember You" and "White Sandy Beach" are among the chosen melodies. Bohme’s classic sextet, will be a treat, with founding member, trumpeter Don Hazzard joining the group for that piece. Also on the program, baroque arranged for brass, since the whole idea of a brass only ensemble is quite recent, just a hundred fifty or so years old. With that in mind, The Honolulu Brass will premiere a new work too, says French horn, Julia Filson. The Honolulu Brass commissioned composer Anthony DiLorenzo to arrange a suite of Hawaiian music for this anniversary. Di Lorenzo has worked on projects that range from a 300 member choir to solo trumpet, including the Marvel Avenger films and others. Hawai‘i’s music, however, was new for him. DiLorenzo, a trumpet player, features Hawaiian songs from the last 40 years in an arrangement that showcases their melodies and harmonies. The Honolulu Brass Quintet 40th Anniversary Concerts happen at WCC’s Palikū Theatre Monday March 14th and at HoMA’s Doris Duke Theatre Monday the 21st. Find tickets here. Students with ID are always free a half hour before each concert. The Honolulu Brass Quintet is one of the ensembles in Chamber Music Hawai'i, whose season continues with the Galliard String Quartet April 12th. This Sunday, the versatility and virtuosity of brass instruments will be on display at Hawai’i Theatre. One of the world’s foremost brass quintets, the Spanish Brass, will present a concert featuring works that span styles from Bach to Duke Ellington, with a special nod to Spanish composers. In eleventh century Europe, night watches would carry horns to mark the passage of time and to signal warnings. Gradually, the watchmen became proficient musicians, performing at ceremonies, official functions, and eventually, in social settings. Today military and political occasions are still marked with brass flourishes, and occasionally, churches and cathedrals ring with the spirited sound of brass choirs. HPR’s Noe Tanigawa reports on the Honolulu Brass Choir’s upcoming concert at St. Andrew’s Cathedral.